Crowdfund marketing is all I do, and I have been able to use my knowledge and experience to raise millions of dollars for clients. Along the way, I have picked up some Kickstarter promotion strategies which are game-changers when executed properly. Below, I break down exactly how to implement them so that you can get your campaign to the best possible start. – Influencers – Social media celebrities, Youtube stars, etc. The key is to keep your email short and invite them to find out more. Some entrepreneurs make the mistake of copying and pasting the same email, and sending it through as many “Contact us” forms as possible. As a result, they hear nothing back, or get an angry email saying “Take me off your list!!”. The best type of email marketing is tailored, conversational, succinct and persuasive. – A blog: This allows you to pull something out which can be discussed in your email. – Did they attend any events recently? You can make a comment on this. Makes the email more tailored. – Does their social media profile show that they have a keen interest in a specific topic? Mention it in your email. Using any of the things below shows that you aren’t a spammer or one of those lazy entrepreneurs who send an email out to a huge list of people they don’t know and pray. If you want people to back you, they have to like you. In order to keep track of each person in the email list, create a spreadsheet and record particular interests, recent posts or anything that jumps out at you from their social media profiles. I just read your post regarding how automation is set to change the way of work as we know it. The conclusion when you showed that it is just part of the world changing, really hit home for me. I am actually about to launch a crowdfunding campaign for a product which helps people to automate certain task in the home. We have been working for a long time on it. Would you like to send you further details on it? Promise it won’t take much of your time. If you don’t get a reply after a week, send a follow-up email asking if they received your first email. Emailing influencers can take a long time. If you want to reach thousands (or even millions) of people and speed up your crowdfunding marketing, you should use paid, social media ads. Facebook is a marketer’s dream because it enables you to get very specific about who you are targeting. 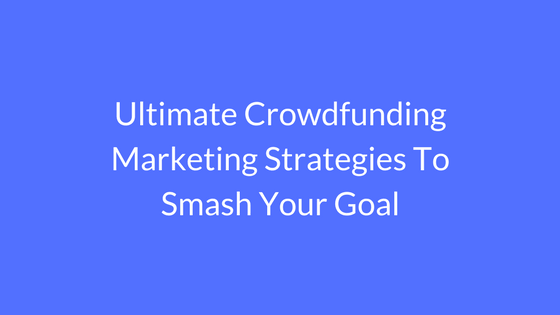 The key is to place a compelling message in front of people who are likely to be interested in your crowdfunding campaign. – Organisations: Which organisations have members which are likely to be interested in your campaign. For instance, an eco-friendly product suits fans of Greenpeace. – Businesses: Are there any major businesses known for creating products or services similar to yours? – Celebrities: Are there any celebrities known for promoting a similar product to yours, or have a relevant following? If so, target them inside Ads manager. Ideally, you should have two social media campaigns running: one prior to the launch of your campaign, and the other during. There is no one size fits all solution for social media advertising, as each project is different. Therefore, feel free to get in touch to see how I can help you with this. Sure, crowdfunding is a ‘digital’ way of raising money; however, you can exponentially increase your number of backers by going to the right events. Ask yourself “What is my target customer mainly interested in?” Then look for events which they are likely to attend. You could give a presentation, get a stall to display your project or offer something in return for email addresses. An inexpensive way of gaining traction with events is to pay a small fee to have your project mentioned in email addresses or letters sent out to attendees. Every single marketing website preaches about the importance of having a blog; however, they rarely talk about concrete ways of getting traffic. Guest blogging is a great untold crowdfunding marketing strategy, you post content on a website which gets a lot of traffic and is relevant to your product. The key is to make sure that they allow you to post a link in the author byline. This method of marketing is getting incredibly popular due to the fact that it is free, effective and is a good way of building credibility prior to launching a campaign. For instance, you can state “appeared on website”. In order to find websites which accept guest bloggers type in “Write for us” plus the industry of your product into Google. Run websites through SEMRush in order to find out how much traffic they get. You would also want to look at their websites and social media to see how much engagement it receives. Create an Excel Spreadsheet and add the best prospects. Also add some notes about the kind of website they are. This would enable you to develop pitches which have a good chance of getting accepted. Next, you will need to come up with some compelling ideas. It is best to pitch ideas which haven’t been covered by the website and would also work well with their audience. Some websites prefer “how to posts’, while others prefer a conversational tone. Most would make this clear in their contributor guidelines. For each headline idea you create, add an outline which starts from the introduction and ends at the conclusion. This way they know exactly what you plan on writing about. Next, give one or two sentences on why you think it would work well for their audience. Your probability of success improves significantly if it is linked to a current event. Use the same email template as the one in the outreach section of this post. Just swap out the second paragraph with why you think your post will work, the headline and outline. The same rules of following up every 7 days still apply. Medium is a blogging platform which has a big community of readers. Medium publications are like magazines and enable you to reach a dedicated audience quickly. You can also start your own Medium publication and post original content as part of your crowdfunding marketing efforts. A majority of Medium users have Twitter accounts, and tend to engage more with articles than on ‘normal’ blogs. Therefore, Medium is a good place to write compelling content, and direct people towards signing up for the waiting list of your crowdfunding campaign. Seeing is believing, and no matter how well shot your product video is, or the number of stunning images you take, nothing can beat having people use it. If your product is an app or software, you can still provide product demos. Set up a stall at relevant events (revisit the events section above) and let people experience it for themselves. If possible, capture video of people using the product. This can be used for Facebook video ads. The best way of persuading people to back your campaign is to show the positive response people have to it. When I mention advertising on Youtube, people look at me as if I am crazy. “That must be really expensive. We can’t afford that!”. Interestingly, Youtube has a very similar bidding method to Facebook. Moreover, unlike Facebook, you only pay when people watch at least 30 seconds of your ad. Notably, most Facebook users have their sounds turned off when watching videos. This is especially true when they are in public. And if they can’t hear the video of your ad, it isn’t as convincing. You can go around this problem by adding subtitles. On the other hand, Youtube users tend to have their sound on. Therefore, you are guaranteed that your message is being heard. The more engaging your video ad is, the lower the cost. The best Youtube video ads tend to not look like ads. They fit into the website. People visit Youtube to be entertained; therefore, your ad should do that. This is a good lesson for all types of advertising. Make your ad fit the website and audience while delivering the message and inviting them to take a single action. There are many press release services out there, and most will promise you the earth and deliver nothing. A majority just blast your press release to as many journalists as possible and hope that some of them bite. Moreover, they won’t work with you to write a compelling press release which journalists would want to write about. The press make their bread-and-butter by writing interesting stories. Therefore, it is important that your press release is news-worthy. If you can’t imagine it on the front page of a major news site, then you should skip this tactic. I work diligently to create press releases which compel the press to write about my clients’ products. Press attention can take your crowdfunding campaign to an entirely different level, and enable you to raise more money than you thought possible. On launch day, your crowdfunding campaign will get off to the best possible start if your “tribe” post about it at the same time. This is the culmination of all the hard work. Thunderclap.it is used to make sure that people post about your campaign at the same time. Some campaigns have trended by using this method of crowdfunding marketing. Success leaves clues. One of the things you should do when planning for the launch of your crowdfunding campaign is to look at successful campaigns in your industry. – Break down the style of visual content. – Make a list of journalists and influencers who promoted them in social media. – Make a list of people who interacted with the project on social media. – Dissect their crowdfunding marketing materials. Which events did they attend? Did they make guest appearances on any podcasts or Youtube channels? – Run their websites through Semrush in order to find out which websites linked to them and brought in traffic. Knowledge, as they say, is power. The more you know, the more ‘fire’ you will have for your own crowdfunding campaign. In conclusion, I hope that you found this post useful and are able to use it for your crowdfunding campaign. Leverage my knowledge and experience for your crowdfunding project. I can help you to launch a successful campaign from planning to crossing the 100% funded mark.